Democratic presidential candidate Sen. Bernie Sanders, I-Vt., speaks at the Iowa State Fair in Des Moines, Aug. 15, 2015. Free college tuition. Doubling the minimum wage. A single-payer, universal health care system. Those are just a few of the campaign promises by Democratic presidential candidate Bernie Sanders, who does not try to hide that he embraces a form of socialism. The independent Vermont senator's self-identification as a socialist is a rarity for politicians in the United States, which, unlike most other Western democracies, does not have any sort of significant socialist presence represented on its political left wing. Since the Cold War, the term has become something of a dirty word in U.S. politics: a phrase used not just as a description of a political and economic system, but as an insult used by conservatives in an attempt to tarnish the reputation of their left-leaning rivals. Despite his self-described socialist views, Sanders is experiencing an unexpected wave of popularity, and is drawing some of the largest, most electric crowds of any presidential candidate so far. Sanders is now running a solid second to the Democratic frontrunner, former secretary of state Hillary Clinton. In some polls, he has even taken the lead. According to an NBC News/Marist poll released Sunday, Sanders has opened up a nine-point lead on Clinton in New Hampshire, which hosts the country's first primary. A separate poll released late last month suggests he also has crept to within single digits of Clinton in the crucial, bellwether state of Iowa. Does Sanders' newfound mainstream popularity suggest Americans are changing their views on socialism? 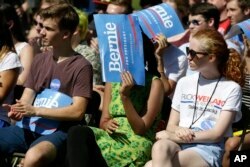 For many younger Americans, that appears to be the case, according to University of Massachusetts, Amherst economics professor Richard Wolff, who said the socialist label is not nearly as scary as it once was. "For people 30 years of age and younger, saying, 'Bernie Sanders is a socialist' cuts exactly no ice," Wolff told VOA. "It's useless. It doesn't persuade anyone." A Gallup poll conducted earlier this year lends weight to that view. Audience members look on as Democratic presidential candidate, Sen. Bernie Sanders, I-Vt., speaks during a town hall meeting, Sept. 3, 2015, in Grinnell, Iowa. In the 18-29 age bracket, 69 percent of respondents said they would have no problem voting for a socialist presidential candidate. Older Americans, however, were less sure, with only 47 percent of respondents of all ages saying they would vote for a socialist. One reason why younger people are more open to the 73-year-old Sanders' message is that they may not even remember the Cold War, said Wolff. "Those battles are now two or three decades old. For young people, this is barely known history," he said. Another possible explanation for the popularity of Sanders' message is the recent turmoil in the U.S. economy that has led to rising inequality. That is the case for Christy Goldsmith, a doctoral student who lives in Columbia, Missouri. "The biggest problem in America in my view is the wealth gap," she told VOA. Goldsmith worked for Hillary Clinton's unsuccessful presidential campaign in 2008, but said she now plans to vote for Sanders. "I don't mind publicly identifying as democratic socialist at all," she said. "But I think it's important to make the distinction between that and [traditional] socialism." That phrase - democratic socialist - is the same one Sanders often uses to describe himself. As a political concept, it is distinct from the Marxist-Leninist brand of socialism commonly associated with one-party rule and state dominance of the economy. Sanders recently explained the concept of democratic socialism in a crowdsourced question and answer session published by the NowThis online media portal. "What democratic socialism is about is having a government which reflects the interest of ordinary people rather than what is currently the case, the billionaire class," Sanders said. As he often does, Sanders used Scandinavian countries - specifically, their universal health care, state-funded college education system and generous worker benefits - as a model for government practices he would like to see. Sanders also dismissed the notion that these views are incompatible with a democratic system. "In most of those countries the voter turnout is a lot higher than it is in the United States," he said. "They are pretty vigorous democracies." Sanders' views are basically in line with mainstream social democratic and labor parties in northern Europe, according to John Halpin, who studies political theory and public opinion at the Center for American Progress. "His 'socialism' is basically the wide provision of public goods like universal health care, paid vacations, family leave, and debt-free college education financed by progressive taxation on the wealthy and corporations," Halpin told VOA. Given the differences between these policies and traditional socialism, there is some debate as to whether Sanders should even be called a "socialist" at all. Noam Chomsky, the renowned leftist political analyst and professor at the Massachusetts Institute of Technology, is among those reluctant to use the phrase to describe Sanders. "I think he should be regarded as a New Deal Democrat, which is about what 'socialism' has come to mean, very remote from its traditional meaning," said Chomsky, referring to supporters of Franklin D. Roosevelt's domestic relief programs in the 1930's. "That places him far to the left in today’s political spectrum, in which mainstream Democrats are what used to be called 'moderate Republicans,'" Chomsky said in an email to VOA. Like most other analysts, Chomsky thinks it is "very unlikely" that Sanders will win the Democratic nomination. But the senator could still affect the presidential race in other ways. "His campaign opens up questions and issues that are otherwise marginalized, and will probably press the Democrats toward somewhat more progressive positions. In words at least," Chomsky said. Stephen Zunes, professor of politics and international relations at the University of San Francisco, said Sanders has already changed the dynamic of the race. "Clinton, who has traditionally sided with the more center-right of the Democratic Party, has shifted her rhetoric to a much more populist kind of tone, which is clearly a reaction to Bernie Sanders and his growing popularity,” he said. Could a Sanders campaign really open the door for more people in the United States to identify themselves as socialists? Halpin, with the Center for American Progress, said it is not likely. "Americans generally don't like predetermined ideological labels and believe they can take ideas across the spectrum," he said. "Without an organized socialist party or movement, it's hard to see it making much of an impact on its own." Trevor Burrus, a research fellow at the CATO Institute, a libertarian research organization in Washington, agrees. "I think real socialist policies are still quite unpopular," he told VOA. "The popularity of highly redistributive welfare states, as well as animosity toward 'the rich,' tend to go up when the economy slows down, as it has done in recent years," he said.